And so, naturally, to Modest Mussorgsky. ELP led me to 'Pictures from an Exhibition,' I did the rest. This was my first ever live piece of classical music. Well, I say that - there must have been other items on the programme that night, but I don't remember any of them. Perhaps my father would remember - he took me to the Music Hall in Aberdeen - my parents were regular attenders (and, as far as I know, still are) at the (R)SNO's concert seasons; I must have used my mother's ticket that night. I presume that they were under Sir Alexander Gibson, but I really only remember the music - the familiar 'Promenade'; the scuttling chickens; the Great Gates of Kiev... I wonder now why I didn't start going more often - that single concert made a strong impression on me. Maybe it just wasn't 'cool' enough; maybe I was too much into too any other things. I missed a lot, though. One perfect, neat thing. To celebrate my father’s 70th birthday, and perhaps to pay him back just a little for starting this whole thing off in the first place, I took him to the Proms, to see a performance of ‘Pictures’. It was a terrific evening, with the usual Ravel orchestration ditched for a mix of other orchestrations, some of them quite striking. I have a recording from that evening, and I can’t think of a better new entry for this list. Much derided, both at the time and, even more, since - and not without reason (if you want a good laugh, try searching for the lyrics of Pete Sinfield), they were nevertheless as important to me and my musical education as anything I heard in the mid-Seventies. It was a music class, I recall - I think the teacher's name was McPherson, but I might be wrong. At any rate, he decided to try and impress us with some modern music, and thought that comparing and contrasting the Ravel orchestration with ELP's version of 'Pictures at an Exhibition' would at least penetrate our disinterested teenage brains. Well, it worked with me. 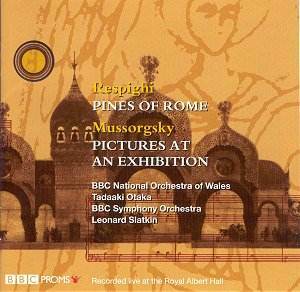 I'll come back to Mussorgsky in a minute, but the version I rushed out to buy was ELP. Now, say what you like about the pretentiousness or otherwise of what they were about, but these guys were (and still are) proper musicians, with real musical ideas, and they opened my mind to so much which I would otherwise have scorned. I retain, for instance, a fondness for the Ginastera Piano Concerto - a tortuous piece of music - thanks to Keith Emerson's 'Toccata', and I would never have explored Aaron Copland otherwise. When 'Works, vol. 1' came out, I snapped it up, and loved it in all its variety, getting to know Emerson's Piano Concerto, and considering it the equal of any I'd heard before then. Which, of course, was hardly any - I didn't know any concerto the way I knew this one. Many, many years later, I decided to dig it out and listen again, confident that my teenage enthusiasm would prove to have been misplaced. Yes, I still listen to ELP on occasion. What I didn’t mention at the time was the prog rock rivalry which existed at school – everyone was allowed Pink Floyd, for some reason, but then you had to choose – either Yes, ELP or Genesis. My path had been set, and so until about half a dozen years ago, I had never listened properly to either of those two other bands in their Seventies pomp. On mature reflection, I kind of wish I had – Gabriel-era Genesis, for example, is a splendid thing of its type. But I’ll always be an ELP boy, mainly, I think due to Keith Emerson’s keyboard skills. Not much, really – I bought some of the CDs I used to own on vinyl, and I listened to some of the post 1980 material. I really wish I hadn’t. I’ll stick to my memories, thanks. Oh, and while I was researching links for this, I discovered Rachel Flowers. Wow. Just wow. I love that this music can still provoke that reaction in me. Well, I don’t really have anything to add to the memory – it still sounds like Gershwin, and I’m sure I read somewhere that Ritchie Blackmore had indeed based the riff on ‘Fascinatin’ Rhythm’. There was much I didn’t say about Deep Purple; how I gradually acquainted myself with their back catalogue, how I figured out who was and had been in the band; how I despaired of ever seeing them, as they disintegrated around the time I started going to gigs, and then got back together just as I had tired of the whole concert-going experience – more on this later, I’m sure. All you have to do is wait 38 years, apparently. Earlier this year, the boys and I trucked along to the CN Centre to watch Deep Purple in the flesh. Of course, in keeping with Purple, there were relatively few members of the classic lineups in the band, but Gillan, Glover and Paice were all present and correct, and – much to my surprise, they still sounded like a proper rock band – it could have been cabaret, but it was way better than that. For reasons which will only be obvious if you’ve studied the history of the band, they didn’t play ‘Burn’. It didn’t matter. I'll start at the beginning, with the Beatles - Michelle. An odd choice, you might think, but it's the first piece of popular music I'm conscious of knowing. It wasn't a new song at the time - this must have been about 1968 - but there was a girl in my infants class called Michelle, and we all sang it. It's probably also the first piece of French I ever knew, although I can't reconcile this to the holidays we had in Brittany, when I certainly picked up enough to go across the road and buy the bread every day. It certainly predates the second Beatles song I was aware of - Yellow Submarine: we all went mad for Yellow Submarine when it came out - my friend Guy had the Dinky toy, I was green. Where are you now, Guy? Where are the rest of them - Garry and Glenn, Debra, Mrs Hutchinson - I should look on Friends Reunited, shouldn't I? Engayne Infant School, Upminster: it feels like another world now. I almost certainly don’t remember the Beatles version! Well, of course, what I mean is that the version we all sang back then was the one we were hearing on the radio by the Overlanders. Of course, I do know the Beatles version, but it wasn’t until I tried finding the YouTube links that it occurred to me that what I knew and what I remembered sounded different. Yellow Submarine still stands, of course, and if I really wanted (and thought really hard about last names), I could probably find my old friends on Facebook now. Engayne School is there, of course, although there’s no separate infants part now. And is it another world? Probably not as much now as it was then. Now, from where I sit, all of Britain feels like another world. Don’t think I saw that one coming at the time. Ten years ago, I had this idea. I wanted to mark my 40th birthday by writing something, and then – as I put it at the time – decided on 40 somethings. I compiled a list of 40 pieces of music which served as milestones in my life to that point, and wrote about them on the blog I kept at that time. The original idea, I think, was for it to be a collection of 40 individual pieces of music, but that quickly fell by the wayside – many of the musicians or composers involved prompted more than one memory, and the whole thing got a bit free-form at times, which isn’t in itself a bad thing – it just evolved. So, ten years on, I – of course – have the idea to do it all again. With ten more memories, naturally. This serves more than one purpose; as well as helping me take stock of half a century, and looking at how my musical landscape has (or probably hasn’t) changed in that time, it also will force me to actually do that ‘being a writer’ thing of actually, you know, writing. Every day, or as close to it as I can manage, since there will be some travel involved between now and October 19th, and I’d rather not write and coach at the same time if I can avoid it. How is this helping with 'Going Back?' - well, I'll be writing every day, which is important. Also, some of the people I sent Part 1 to might see this and be prodded into feeding back some of that feedback (Hi, Dave! ), and we're heading out of the summer, so there will be more writing time available. And I'll use it for writing - honest. How this will work: I’ve gone back over the original 40 memories, and I’ve added ten more. A couple of them probably should have been in the first 40, the rest are prompted by things that have happened in the last ten years. I’m working on the order things appear in – ten years ago, everything was random, I might well tweak the order a little this time round. I’ll also mostly stand by what I said last time out, although I reserve the right to embellish and explain if necessary. Where relevant, I’ll update the memories with things which have happened since 2002 – in some cases, that’s quite a significant amount; in others, the memories remain in aspic. Also, there's a lot more information out there now than there was 10 years ago; research for this will throw up all sorts of interesting things, some of which I'll share with you, you lucky people. I’ll try to make it clear what’s old and what’s new, and I’ll definitely replace almost all of the links in the original with working links, mostly from YouTube. They’ll break again, but with any luck, not as quickly as the originals broke. Oh, and if you use Google Chrome, may I recommend the inline YouTube extension? It will enhance your reading pleasure enormously, honest.